On behalf of the entire ApproveMe team, we are excited to announce the release of our newest WordPress plugin: the Contact Form 7 Signature Add-On. With our new Contact Form 7 Add-On, any data captured with Contact Form 7 and any contract that your users fill out is fully valid and will be properly recognized in court. We hope you agree that it’s one of the best Contact Form 7 addons because it streamlines the contract generation process. It turns a website that uses WordPress Forms into a user-friendly contract machine. Like what you hear so far? Let’ get into some of these awesome features. The Contact Form 7 Signature Add-On lets you create legally binding contracts with the information collected through your website forms. Your signer’s personalized data gets automatically inserted into the contract, so less work for you. You can even trigger different contracts using conditional logic. If a form submitter chooses “Plan 1” in a form dropdown, you could trigger the “Plan 1” contract. If they were to choose “Plan 2” you could trigger “Plan 2” contract, and so on. You can follow up with the contract via email, or immediately redirect them to your contract after they fill out your form. Cut out the distractions so you can keep up the momentum and get what you need signed, signed. Speaking of…no one likes having to chase down clients for a signature. Instead of tracking all of your open contracts and scheduling your follow ups, our automatic signing reminder feature will take care of it for you. With the Contact Form 7 Signature tool, just set the trigger date and the frequency. The Contact Form 7 contract workflow will trigger if your contract hasn’t been signed. It sends out a friendly email reminder on your behalf. You don’t need to lift a finger, and your client gets an personal experience. Everyone’s happy. We also make it as easy as possible for them to sign. You can capture a Contact Form 7 digital signature on desktop or on mobile so you and your clients can sign on the go. The health of your business relies on the legality of your contracts. Don’t take them for granted by assuming they’re solid without actually knowing. A document created by a common WordPress contract plugin isn’t guaranteed to stand up in court. It might, but they can’t promise anything. Big problem, especially as we move into an increasingly mobile world. Mobile isn’t going anywhere. Plugins like Contact Form 7 make it easy to automate certain tasks in your business, but here’s something most people don’t realize: These plugins for WordPress forms are NOT responsible for making sure your data is compliant or up to date with esignature laws. And trust us, there are a lot of them to follow. Failure to comply could put your business at jeopardy. The ApproveMe team spent lots of time and resources to make sure that our plugin follows the most current laws regarding electronic signatures. And not just here in the U.S. We did our research and made sure that it’s ready to go anywhere that follows esigning laws. You can have confidence that if things ever get testy, you can depend on your Contact Form 7 Esignature data. When it comes to securing your identity, most plugins take the easy way out. They simply store the image of your legal signature on your FTP server. If you don’t know much about data security, here’s a free lesson: FTP servers can be hacked. 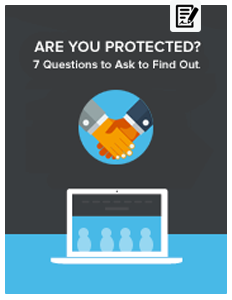 For you, this means the Contact Form 7 signature that gets saved could be compromised without you knowing. We can help you avoid that risk. The Contact Form 7 Digital Signature tool encrypts and stores your data in strategic locations on your server. If someone were to attempt to unencrpyt your data, your file would destroy itself. We don’t take chances when it comes to your security. Why Choose Contact Form 7 Digital Signature by ApproveMe Over the Other Guys? So why should you choose the Contact Form 7 Signature plugin over similar ones from companies like Rocket Genius? See for yourself. Try the Contact Form 7 Signature demo below. If you’re ready to go, you can download the plugin (and read more about why it’s awesome) from WordPress.org. (A valid business license for ApproveMe’s WP eSignature is required).